Hello, Dips here. 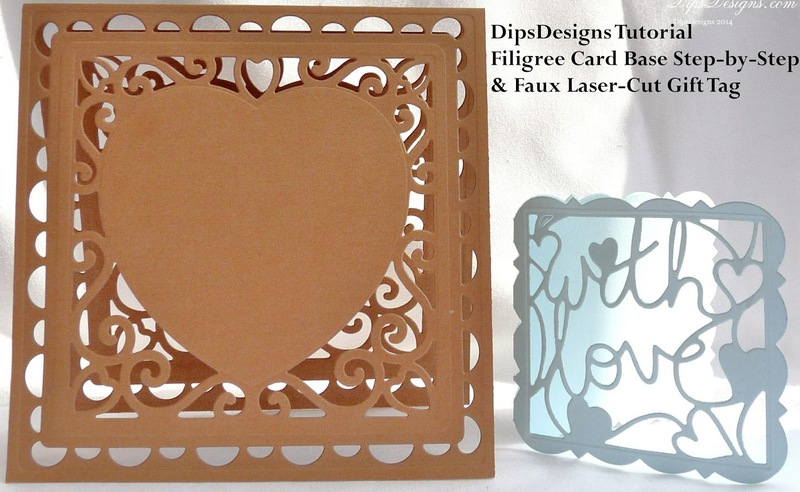 Recently, I promised to provide step-by-step tutorials on how to create a Filigree Card Base. To do this, you need a set of dies with a separate outer cutting edge such as the Tonic Verso Affections Square Base. To achieve this effect, you will need to pass a double-thickness of cardstock through your die-cutting machine, please only follow this tutorial if you are happy that your machine will take a double-thickness of cardstock (mine does but only you knows what your machine will do). First of all, cut an A4 piece of card stock 29.7cm x 15cm, score it in half and fold. 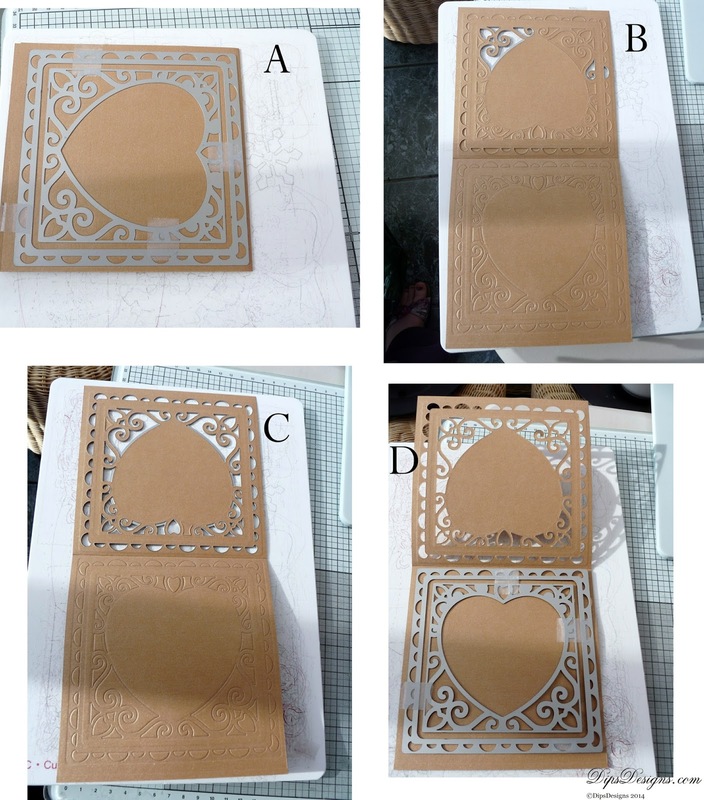 Take the filigree detail sections from your Verso die and tape into place on your folded cardstock. As you can see from the picture above my dies are placed just below and centred to my scoreline. I have a little excess at the bottom and sides, but I will trim these away after die-cutting. You can also see (above right) that I am not using the cutting edges to my dies at all. You will need to pass your die sandwich through the machine 2-4 times, turning after each cut (Picture A above). Check whether the first layer of cardstock has been cut through by carefully opening up your folded card without removing the die (Picture B). If needs be repeat the cutting and turning, but my first layer of card was cut through after 3 passes, and I had a very deep emboss on the second layer of cardstock (Picture C). Remove your die from the front layer of card, keeping the tape in place, and reseat over the embossed detail on the second layer (you can feel when your die has reseated correctly into the groves of the embossed second layer of cardstock). Secure with more masking tape, if required. Leaving the card folded open (so you are now only cutting the back layer), pass back through your die-cutting machine 1-2 times until the back layer is completely cut through. You now have a perfectly matched front and back filigree layer. Trim off any excess to the bottom and sides to create a perfect base. You can use this technique for any filigree die with separate outer cutting edge. This is the technique that I used on this Filigree First Birthday Card, using the Tonic Studios Boudoir Square Base. It is a similar process for the faux laser-cut gift card, except that this time we do use the outer cutting edge and we only detail die cut through a single layer. You can find the tutorial for the gift card and a downloadable pdf of both Step-by Steps over on my blog DipsDesigns.com. Hope you have enjoyed this tutorial, have a great weekend!